"The Pieta" is a work of Renaissance sculpture by Michelangelo Buonarroti, housed in St. Peter's Basilica, Vatican City. This famous work of art depicts the body of Jesus on the lap of his mother Mary after the Crucifixion. 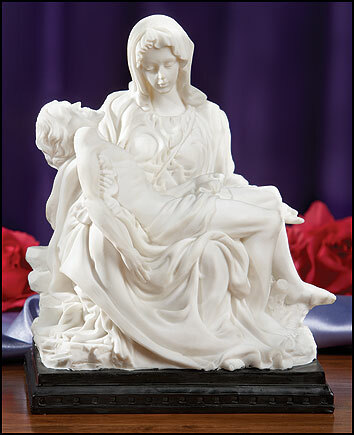 Our touching depiction includes a white resin statue sitting on top of a dark, wood base. Boxed.